Commemorations took place around the world on November 11 to mark the centenary of the Armistice that ended WWI. President Donald Trump and Russian counterpart, Vladimir Putin, were among those who attended a service beneath the Arc de Triomphe in Paris, France. 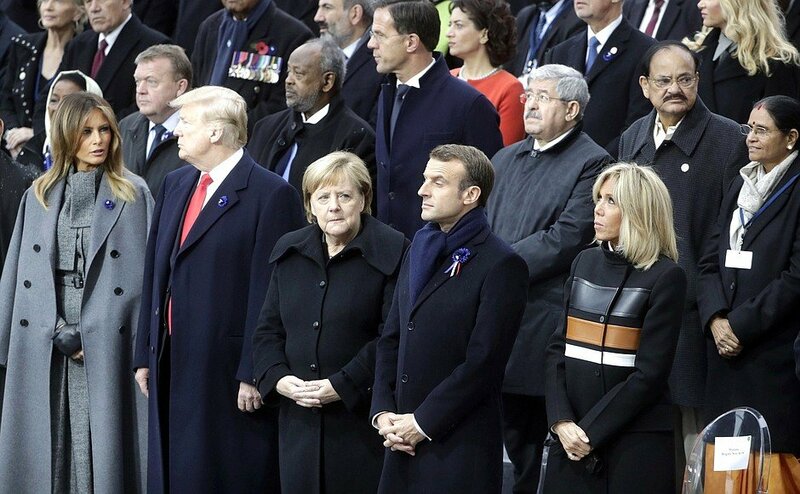 About 70 world leaders gathered in Paris on November 11 for remembrance events. French President Emmanuel Macron led the main event of the centenary – a somber commemoration at the Tomb of the Unknown Soldier, a memorial to France’s fallen under the Arc de Triomphe in Paris. President Macron and German Chancellor Angela Merkel attended a peace conference – the Paris Peace Forum – with leaders including Russian President Vladimir Putin and Turkey’s Recep Tayyip Erdogan. On November 10, Emmanuel Macron and Angela Merkel visited the town of Compiègne in northern France. They signed a book of remembrance in a railway carriage identical to the one in which the 1918 Armistice was sealed. President Donald Trump caused controversy by canceling a trip to a cemetery for the war dead because of bad weather. A group of around 50 activist organizations held a demonstration in Paris in protest against President Trump’s visit.